Now let’s create our chat application. Execute following commands to create a blank project and include all the required dependencies such as socket.io and express required for our project. Now let us integrate socket in the client side. Add following lines in chat.html before the tag. It will expose a global variable io and connect to the host that serves the page.Once a client gets connected in the browser, connect event is triggered and on a successful connection in the client side, client emits an event – joined which has a callback to send data to the server. And the server that is listening for the event – joined will receive the same data. 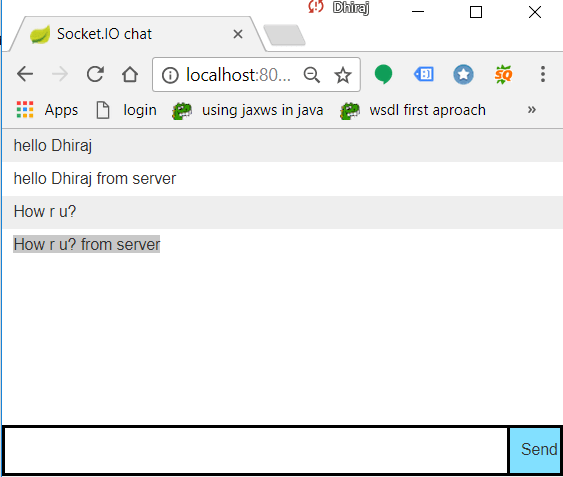 This completes the initial binding between client and server.Now let us make provision for the chat between client and server.Whenever a client enters any message in the text box and hits enter, chat message event will be raised by the client and the server is listening to the same event. Whenever server finds any event with chat message, it will append ‘from server ‘ in the message and emit ‘response message’ and the client will be listening to this event again and accordingly the chat window will be updated.